Cardiovascular disease (CVD) is the number one killer of men and women in industrialized countries. In older age groups, CVD is also the most important cause for hospitalization, and, in many countries, it is the basis of early retirement from work. Thus, CVD is associated with enormous costs for care and loss of productivity, as well as for disabilities, pensions, etc. All this has motivated clinicians and scientists to develop and implement new methodologies and technologies to better care for patients who are hospitalized for heart disease. Efforts to improve care in the acute phases of coronary heart disease (CHD) have been successful. During the last decade, the immediate mortality risk of a patient admitted to coronary care for a suspected myocardial infarction or other acute coronary syndrome has decreased to less than 10%. Despite these achievements, CVD continues to represent a major threat to the health of middle-aged and elderly men and women. This volume addresses myriad aspects of CHD prevention, including biobehavioral and psychosocial factors, behavioral epidemiology, behavioral intervention models, and policy. The first section of the text provides an introduction to CVD prevention and behavioral medicine. The second section introduces two theoretically different approaches to preventive action, high-risk and population-based strategies. The third section describes and discusses the important questions of how behavioral sciences can be conceptually integrated into traditional, medically based, preventive efforts. The fourth section presents both population and high-risk behavioral intervention approaches. 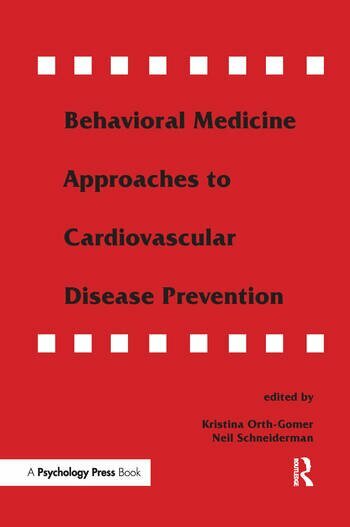 In summary, this volume examines the social environment and its potentials for preventive actions, reviews the psychosocial and biobehavioral mechanisms involved in these effects, and describes concrete and practical implementations of behavioral medicine knowledge as they have been applied to CHD prevention. Contents: Part I:Introduction to Cardiovascular Disease Prevention and Behavioral Medicine. K. Orth-Gomér, Concepts and Theories of Prevention: Reasons for Soliciting Behavioral Medicine Knowledge. S.M. Weiss, Principles of Behavioral Medicine: Implications for Prevention. Part II:Behavioral Epidemiology and Public Health in Cardiovascular Disease Prevention. M. Marmot, A. Feeney, Socioeconomic Factors in CHD Prevention. S.L. Syme, Social Class and Cardiovascular Disease. L.F. Berkman, K. Orth-Gomér, Prevention of Cardiovascular Morbidity and Mortality. Role of Social Relations. T. Theorell, The Demand-Control-Support Model for Studying Health in Relation to the Work Environment: An Interactive Model. J. Siegrist, Stressful Work, Self-Experience and Cardiovascular Disease Prevention. Part III:Biobehavioral and Psychosocial Factors in Cardiovascular Disease Prevention. N. Schneiderman, J.S. Skyler, Insulin Metabolism, Sympathetic Nervous System Regulation, and Coronary Heart Disease Prevention. A. Steptoe, Psychophysiological Processes in the Prevention of Cardiovascular Disease. A. Appels, Personality Factors and Coronary Heart Disease. R.B. Williams, Coronary-Prone Behaviors, Hostility and Cardiovascular Health: Implications for Behavioral and Pharmacological Interventions. M.A. Chesney, New Behavioral Risk Factors for Coronary Heart Disease: Implications for Intervention. Part IV:Behavioral Intervention Models in Cardiovascular Disease Prevention. G. Kok, H.J. Hospers, D-J. den Boer, H. de Vries, Health Education at the Individual Level. B. Oldenburg, P. Graham-Clarke, J. Shaw, S. Walker, Modification of Health Behavior and Lifestyle Mediated by Physicians. G. Burell, Behavioral Medicine Interventions in Secondary Prevention of Coronary Heart Disease. P. Puska, Community Interventions in Cardiovascular Disease Prevention. M. O'Connor, Healthy Public Policy: Getting Governments Onside. Part V:Summary and Conclusions. N. Schneiderman, K. Orth-Gomér, Blending Traditions: A Concluding Perspective on Behavioral Medicine Approaches to Coronary Heart Disease Prevention. "This is a highly recommended book for those who are interested in behavior and cardiovascular disease. It provides the kind of concrete examples needed to stimulate work in the area of disease prevention while providing a framework that firmly ties prevention to our knowledge of behavioral risk factors in cardiovascular disease." "Overall, the volume is a credit to the editors and the various authors. They all show their expertise in many ways --sometimes just the excellent selection of a few things to comment on, somtimes a very personal style. There is really something for nearly everybody starting from the novice to the level of an expert, from the social scientist to the physiologist. Reading it is fun and challenging, too.